Ok, time to really share.... this is one of my favorite websites!!! I was considering using them for my new showroom but I think I've decided to hand paint all my walls...(just because I have so much extra time... ha ha ha!) Anyhow, http://www.WallWords.com has, you guessed it, Wall Words! 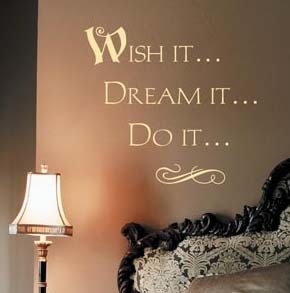 Quotes that are decals you can apply to your walls. There are lots of great quotes you can purchase with several font choices and colors. You can also have them make your own quote. Have fun with this. What a terrific way to personalize your space!